Revised June 2013 with contributions from Diana Fletschner. Food security exists when all people, at all times, have physical and economic access to sufficient, safe, and nutritious food that meets their dietary needs and food preferences for an active and healthy life (World Food Summit 1996). 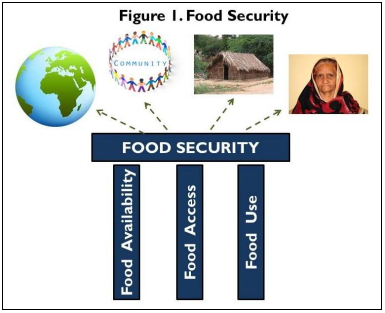 The term “food security” is used to describe food availability, access, and use at many levels, including the global, national, local, household, and intra household levels (see Figure 1). Food “availability” means that an adequate amount of adequate quality food is available on a consistent basis from food produced, purchased, or received from others (including food aid). Food “access” refers to the ability of individuals, communities, or countries to use economic, legal, political, or social entitlement resources to obtain the food necessary for a nutritious diet. Finally, food “use” requires knowledge of basic nutrition and access to complementary resources, such as clean water, sanitation, and health care, to ensure that food consumed meets dietary needs. Creating an environment conducive to agricultural growth and food security hinges upon prioritization of securing land and property rights of smallholders, investors, and other resource users (USAID 2013a; USAID 2013b; United Nations Food and Agriculture Organization [FAO] et al. 2010). Today, a large proportion of the poor lack adequate and secure access to land and natural resources; global trends suggest that without adequate measures to respond to the growing demand for these assets, tenure insecurity is likely to become worse. Efforts to secure land and property rights in an effective and inclusive manner must rely on multi-stakeholder partnerships between government, private sector, and civil society actors, and must operate at all levels, from the local to the global. The Voluntary Guidelines on the Responsible Governance of Tenure of Land, Fisheries and Forests in the Context of National Food Security (Voluntary Guidelines) emerged from these partnerships and offer a roadmap for action. The members of the UN Committee on World Food Security (CFS) unanimously endorsed the Voluntary Guidelines in May 2012. That same year, the CFS launched a multi-stakeholder Working Group to develop and negotiate principles for responsible agricultural investment (rai), which are expected to be completed and endorsed by the CFS in 2014. According to The State of Food Insecurity in the World, a joint publication of United Nations agencies supporting food and agriculture programs, statistics for the past two years indicate that almost 870 million people are chronically undernourished (IFAD et al. 2012). 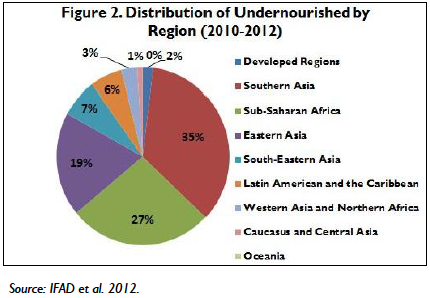 As Table 1 and Figure 2 illustrate, the distribution of malnutrition is highly uneven–close to 98 percent of the undernourished reside in developing countries–and food crises are often initiated or magnified by humans, who can limit the availability of food directly through conflicts, or indirectly through actions that exacerbate the effect of otherwise minor natural hazards (IFAD et al. 2012; FAO 2006). Food price increases tend to disproportionately affect poor families because they often spend a larger share of their income on food. The poor are even more vulnerable if they live in countries that have a food deficit since those areas must import staple food commodities often purchased at higher world prices, or rely on food aid based on fixed budgets. 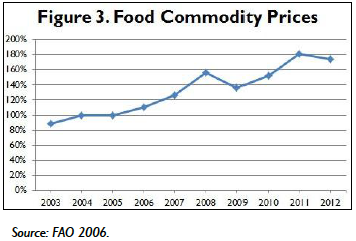 Recent food price increases (Figure 3) have by and large been the result of long-term supply and demand forces that suggest a worrisome trend. The demand for food continues to grow at a rapid pace. This is partly due to the global growth in population–the world’s population is expected to surpass 9 billion by 2050–and partly due to the economic growth of low- and middle-income countries that has increased per capita consumption. In parallel, increasing energy prices and growth in global biofuel production have diverted land away from food production. When coupled with slower growth in agricultural productivity and adverse weather, the combined result is shortages in global food supply and rising food prices (Trostle et al. 2011). An effective strategy for improving food security must address its three pillars, ensuring that there is enough food available for all, that people can access it, and that they can use it to fulfill their nutrition needs. Investing in technologies that enhance agricultural productivity and the nutritional content of crops can result in a larger supply, lower food prices, and healthier food, thereby having a positive impact on the amount and quality of the food available, who can access it, and how much they benefit from it. However, since food insecurity is largely caused by poverty, improving access to food requires increasing the income of the poor (Figure 4).Not surprisingly, given that most of the very poor rely on agriculture and related activities, studies from all developing regions indicate that the income of the very poor respond more to growth in the agricultural sector than to growth in any other sector (Ligon and Sadoulet 2011; Christiaensen et al. 2012). This implies that agricultural growth will reduce hunger and malnutrition more effectively if it involves smallholders. 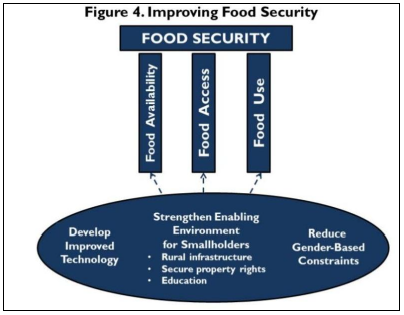 A food security strategy must therefore create an enabling environment that levels the playing field for smallholders, and provides them with the tools, skills, and incentives to participate and be competitive by: (i) investing in rural infrastructure such as roads, information systems, storage facilities, and physical markets to reduce transaction costs and allow them to reach markets; (ii) ensuring land tenure and property rights to provide incentives to invest and make long-term decisions; and (iii) providing the education and skills needed to successfully participate in markets (IFAD et al. 2012). Finally, strategies to increase tenure security must recognize women’s vital role in food production and address gender-based constraints along the value chain (USAID 2012b), including improving their access to resources such as land, credit, and productivity-enhancing inputs and services. Women are directly involved in food production; research has long shown that women can equal men in productivity as long as they have equal access to agricultural inputs, training, and extension services. Reducing the gender gap in access to productive resources increases household production and aggregate agricultural output (Quisumbing 1996; Allendorf 2006; Fletschner 2008). Furthermore, improvements in household food security depend not only on the level of income of the household but also on who earned that income. Data from Africa, Asia, and Latin America show that women are more likely than men to spend their income on food for their families. Compared to men’s income, women’s income has been found to have a greater effect on household calorie consumption, on the share of the family budget allocated to staples, on food expenditures, on children’s weight for height, and on preschoolers’ weight for age (Quisumbing et al. 1995). Box A. What Do We Mean By Tenure? Tenure systems define and regulate how people, communities, and others gain access to natural resources, whether through formal law or informal arrangements. The rules of tenure determine who can use which resources, for how long, and under what conditions. They may be based on written policies and laws or on unwritten customs and practices. What is produced and who consumes it depends greatly on tenure security. Clear and secure property rights for owners and users reduce the potential for conflict and the threat of eviction; provide incentives to conserve and improve these assets; encourage land-related investments; allow land rental and sales markets to transfer land to more productive uses and users; and, if coupled with cost-effective systems of land administration, reduce the cost of credit by leveraging these assets as collateral (World Bank 2008). A large proportion of the poor, however, lack adequate access to quality land, and when they do have access, they have limited rights to it. For example, they might be able to use land for cultivation but not be able to use it as collateral, rent it, sell it, or hold the land for a long enough period to recoup labor and capital investments. Others are unable to enforce the rights they do have because they are unaware of those rights, cannot afford the required paperwork, or because the legal or customary authorities do not recognize them. Upward trend in fossil fuel prices that has led governments to expand the area dedicated to biofuel production. As a strategy to achieve long-term energy security and to expand their exports, an increasing number of countries have mandated targets for use of biofuels in transportation fuels (Dufey et al. 2007). In addition to diverting land from food production, biofuel producers’ growing demand for land and water often leads to vulnerable groups losing access to the resources on which they depend, which affects how much food is available locally and who has access to it (Cotula et al. 2008). Rapidly growing demand for food that has led governments to encourage large-scale commercial agriculture at the expense of small farmer agriculture. Despite extensive literature documenting no economies of scale in most large-scale agricultural schemes (Songwe and Deininger 2009), governments in many countries have promoted large-scale agricultural investments by allocating large tracts of land for large-scale agribusiness ventures in return for advantageous leasing fees and other preferential tax incentives (Vorley et al. 2012). Increasing demand for arable land for carbon sequestration as a response to climate change. As long as carbon sinks are located on marginal lands, it is possible to achieve considerable biodiversity and environmental gains without sacrificing food security. If, on the other hand, the protected areas set aside are on productive agricultural land, competing demands for land can lead to conflict, displacement, and food insecurity. In addition to increasing food prices, the global demand for land for large-scale agricultural ventures and carbon sequestration may contribute to undermining smallholders facing land expropriation without adequate or fair compensation. Documentation of the extent of the spread and dynamics of large-scale land acquisition remains elusive despite new tools such as the Land Matrix established to record the extent and range of transactions (Land Portal.info). A woman’s access and control over land can improve if: (i) she gains access to more land; (ii) she gains access to land of higher quality or in a better location; (iii) she gains additional rights over a plot of land to which she already had access; or (iv) her land rights become more secure. A woman’s land rights are secure if: (i) they are legitimate; (ii) they are unaffected by changes in her social status; (iii) they are granted for an extended period of time; (iv) they are enforceable; and (v) her ability to exercise them does not require an additional layer of approval that only applies to women. The nature of large-scale land acquisition varies greatly from place to place. The contractual arrangements occur in areas that are customarily or privately owned; they may involve sales or leases; investors may be nationals or foreigners; the parties negotiating the deal may include governments, local elites, corporations, traditional authorities, or farmers’ associations; they may result in a contract-farming agreement or simply wage labor contracts; and they may range in size from a few hundred to thousands of hectares (Behrman et al. 2011). In practice, the extent to which these contractual arrangements benefit the local population and reach the most vulnerable depends on the inclusiveness and transparency of the negotiation process, on whether the new arrangement leads to employment or income-generating opportunities for locals, and on what is produced on the land and for which market (Behrman et al. 2011). Recent research suggests that “these deals have so far delivered few of the benefits that governments and communities hoped to obtain, and are causing harm to local livelihoods. In many recipient countries, small-scale producers have insecure rights to their land, and governments are allocating land without adequate consultation or compensation. The jobs created by plantations are often few, short-lived, and low-paid, particularly on highly mechanized farms, and people who lose land do not necessarily get the jobs” (Vorley et al. 2012, p. 13). Women’s ownership and control over assets can affect what households produce and how the proceeds from production are allocated within the family. Studies have found that increases in female landholdings are associated with increases in household food expenditure (Katz and Chamorro 2002). When women own land, their children are less likely to be severely underweight (Allendorf 2006). There is a positive relationship between the amount of assets, including land, which a woman possesses at the time of marriage and the share of household expenditures devoted to food (Quisumbing and Maluccio 2002). Despite their (potential) contributions to all three pillars of food security, women’s roles in the agricultural system are often compromised because of their weaker access and rights to resources, including land. These disparities stem from the differences women experience between statutory and customary tenure frameworks. Women are marginalized in the agricultural development process when local authorities fail to recognize women as equally capable and deserving of support. During the design of agricultural programs, planners may lack gender sensitivity. Women’s voices may be left aside during negotiation of contracts and leases. While arguably these differences in access to resources could be overcome with family intermediation (their husbands, parents, brothers, or sons acting on their behalf), empirical evidence overwhelmingly suggests that women cannot always count on male relatives, and even when they can, relying on indirect access to resources can leave women in a more vulnerable position (USAID 2011; Fletschner 2009). Thus, to assess whether women’s land rights are secure, it is important to pay attention to five dimensions. First, the degree to which a woman’s land rights are legitimate (and therefore secure) depends on who recognizes these rights–i.e., whether her land rights are recognized by law, custom, her family, her clan, and her community. Second, a woman’s land rights are secure if they are not vulnerable to changes in her family structure (e.g., the death of her father or husband, or her husband taking a second wife) or to changes in her clan or community (e.g., changes in the leadership who granted her those rights). Third, for rights that are granted for a fixed period of time, the longer the period the more secure are her rights. Fourth, a woman must be able to enforce her rights for them to be secure. She will be able to do this if she is aware of where to present her claim, if she can easily get to that forum, if she has the ability and the means to present her claim, if her case will be heard, if the overall process will not take a very long period of time, and if a decision in her favor will be implemented. Lastly, a woman’s land rights are more secure if they can be exercised without being subject to conditions that men would not be asked to fulfill (e.g., obtaining the approval and permission of her husband, father, or other male relative). Prevent tenure disputes, violent conflicts, and opportunities for corruption. The global community is increasingly recognizing the economic, political, social, and moral imperative of securing land and resource rights. To strengthen the enabling environment requires multi-stakeholder partnerships that work at all levels, from local to global, and involves all sectors–governments, the private sector, and civil society. In 2012, 96 governments agreed to the Voluntary Guidelines (Box C) that established principles and internationally accepted standards for responsible governance of tenure to achieve food security and sustainable livelihoods, with a special emphasis on vulnerable and marginalized people (FAO 2012). These guidelines can be used by states, courts, government agencies, communities, individuals, civil society, investors, tenure professionals, and academics as a reference when designing or assessing strategies, laws, policies, or programs (FAO 2012; FAO 2013). Existing rights to land and associated natural resources are recognized and respected. Investments do not jeopardize food security but rather strengthen it. Processes relating to investment in agriculture are transparent, monitored, and ensure accountability by all stakeholders, within a proper business, legal, and regulatory environment. All those materially affected are consulted, and agreements from consultations are recorded and enforced. Investors ensure that projects respect the rule of law, reflect industry best practice, are viable economically, and result in durable shared value. Investments generate desirable social and distributional impacts and do not increase vulnerability. Environmental impacts of a project are quantified, and measures are taken to encourage sustainable resource use, while minimizing the risk/magnitude of negative impacts and mitigating them. In parallel, the Principles for Responsible Agricultural Investment (PRAI) (Box D) developed by the World Bank, FAO, IFAD, and UNCTAD based on detailed research on the nature, extent, and impact of private sector investment and best practices in law and policy produced a framework for national regulations, international investment agreements, global corporate social responsibility initiatives, and individual investor contracts (FAO et al. 2010). These internationally recognized principles are currently being piloted with governments and the private sector around the world in parallel to the CFS-led participatory, multi-stakeholder consultation process to develop the Principles for responsible agricultural investment (rai). While the distinctions between the PRAI and the rai may appear confusing, the PRAI are designed to encourage responsible agricultural investments more broadly, the rai tend to address issues that affect smallholders. While there are many avenues through which USAID could support initiatives to strengthen the security of land tenure and property rights, the US Government’s Global Hunger and Food Security Initiative (Feed the Future [FtF]) is a timely opportunity to complement these international standards of best practice. FtF partners with countries around the world to support the development of the agricultural sector for economic growth while increasing incomes and reducing hunger, poverty, and malnutrition (USAID 2012a). By incorporating considerations discussed here about how tenure security can increase agricultural productivity, the FtF approach can be strengthened even further. Without squarely addressing tenure security and property rights issues, investments in food security programming may be comprised and, indeed, be undermined. While the adoption of the Voluntary Guidelines and on-going consultations to develop the Principles for responsible agricultural investment (rai) demonstrate an emerging global consensus on policies and practices to secure land tenure and property rights for people around the world, specialists agree that strengthening property rights to achieve food security and social benefits requires additional steps. Tailor the roadmap offered by the voluntary guidelines and sequence interventions according to each country’s institutional and economic context. Adherence to the guidelines may require reforming or harmonizing laws and regulations, simplifying administrative processes, decentralizing land administration services, and making information meaningful and easily available (USAID 2013b). Address gender discrimination, touching on all manner of land and natural resource rights issues. This will entail consideration of all statutory and customary laws that govern women’s rights to land and natural resources, including family and inheritance laws; sensitizing and building the capacity of decision-makers and service providers to ensure that interventions, processes, and services are gender-sensitive and reach women effectively; enhancing women’s abilities to access complementary agricultural inputs and markets to minimize loss of access to land and natural resources; and increasing allocation of resources to mainline ministries to address gender issues in agriculture (Fletschner 2011; USAID 2013b). Encourage responsible agricultural investments to enhance productivity, and develop infrastructure and markets in a way that benefits both investors and local communities. There is need of more transparent and participatory processes that include all those who could be affected by domestic and international investments. During the negotiation of contracts between investors and local communities, special measures are needed to assure that community rights are recognized and that measures are established to promote sharing of benefits. During negotiations, information on contractual clauses needs to be made fully available and easily accessible to local communities. Support to local communities and vulnerable peoples to enhance their negotiation skills can be an important way to help level the playing field and, in the long-term, reduce the potential for conflict and resistance over contracts (USAID 2013b.). Improving land administration processes through making registration of land rights easier and more affordable so that land transactions that might otherwise take place informally are recorded formally. Documenting and registering community land rights as a way to increase tenure security can facilitate land transactions with national and international agricultural investors (World Bank 2008). Formalizing historical rights to land can benefit agricultural investors through providing clarity and transparency at the time of negotiating contracts and agreements. Clarification and formalization of land rights may make it easier, less risky, and potentially cheaper to carry out land transactions. New land information technologies are bringing down costs of formalization (World Bank 2008; USAID 2013b). Taking account of customary tenure arrangements by formalizing the land and resource rights under customary traditions as a way to help local communities benefit in the negotiation process around land sales, leases, or contract farming arrangements. While clarifying and formalizing the historical rights of local communities to land and other natural resources may be a long and arduous process, ignoring them sets in motion conflicts between local communities and external investors. Conflicts may not only break out into violence against investors, but also sabotage and create resistance against much-needed investments. For this reason, it is important to increase the capacity of local dispute resolution bodies to resolve disputes quickly and at low cost, but also to put in place formal mediation mechanisms around contractual arrangements (USAID 2013b; World Bank 2008).